Artisanal Creations Set of 12 White and Gold Knobs are a perfect addition to your classic or retro style décor theme. Handcrafted entirely out of ceramic, these decorative cabinet pull handles feature an intricate pattern in gold hand painted by skilled artisans. The combination of white and gold looks classy and pleasant. These round cabinet pulls are 1.5 inch in diameter and have a projection of 1 inch, so that you can hold it comfortably while opening or closing the cabinet door. You do not need to call a professional for installing these ornate knobs. We supply a detailed set of instructions and the hardware required for quick and easy DIY installation. You would require a hand drill or a 1/8 inch hole for installing these knobs. We use premium materials and pursue creativity to create exquisite furniture hardware options like the white and gold knobs. Set of 12 Contemporary Knobs: give your home a décor a classic appeal with these white and gold cabinet pull handles. These beautiful knobs are sold in a set of 12, and are perfect for use in bathroom, kitchen, living room, or bedroom. Handmade Drawer Pulls: these decorative cabinet knobs are handcrafted out of ceramic by skilled craftsmen. Each piece in this set of 12 is slightly different and unique, which is a characteristic of the handmade products. White and Gold Knobs: these simple yet elegant white ceramic knobs feature an intricate pattern hand painted in gold by the craftsmen. The combination of white and gold blends perfectly with a variety of décor themes. DIY Ornate Knobs: these decorative ornate knobs can be installed without the need of a professional. A complete set of instructions and the hardware required for DIY installation are supplied with these knobs. You would need a hand drill or a 1/8 inch hole for installing these knobs. 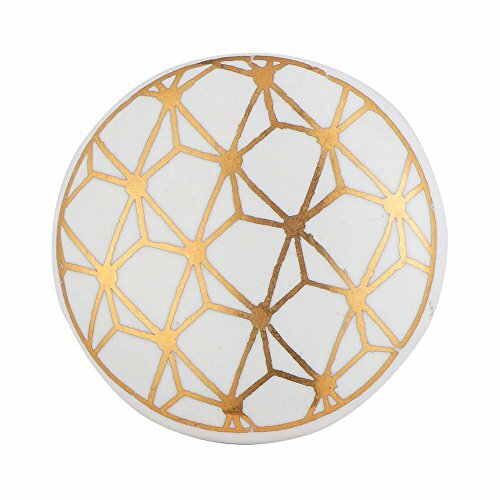 Decorative Knob Dimensions: these decorative white and gold ceramic round knobs are 1.5 inch in diameter and feature a projection of 1 inch. The bolt of these knobs can be trimmed to size according to installation requirement. If you have any questions about this product by Artisanal Creations, contact us by completing and submitting the form below. If you are looking for a specif part number, please include it with your message.